Join us at the Melbourne School of Design (MSD) for a chance to experience a day in the life of an MSD student. Sit in on a lecture, attend an information session or take a tour of our world-class facilities. Academics, current students, alumni and admissions staff will be on hand to provide expert advice and share their experiences. Registrations for the building tour and workshop tour will open on Monday 23 October. Looking for a way to combine your analytical and creative thinking skills? 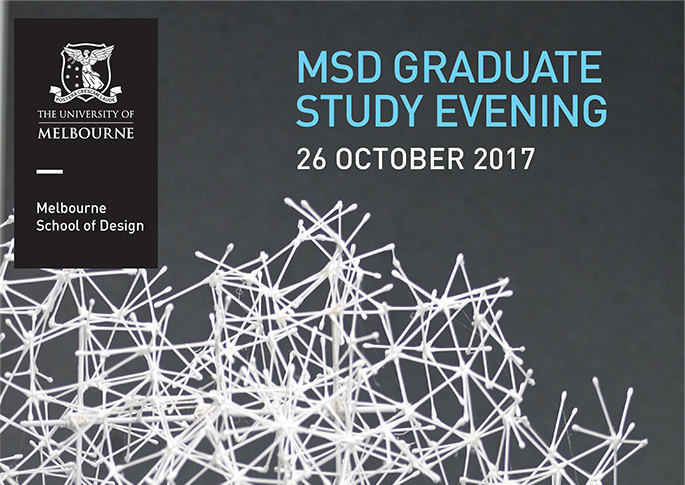 Join Professor Andrew Ooi and one of our current Architectural Engineering students to find out more about MSD’s newest graduate program. Find out firsthand about studying and working in Construction Management with our alumni, current students and program coordinator A/Prof Robert Crawford. Discover the opportunities and experiences available to our students and learn how to prepare your portfolio for entry with Chair of Architectural Design Professor Donald Bates. Join Professor Piyush Tiwari to get a taste of our Master of Property program, as he discusses the trends in land use, density and land price in Melbourne. Sit in on a lecture with Dr Iderlina Mateo-Babiano to explore how land use and transport interact.